The annual themed Christmas concert, “A Gift of Love” which has been hosted by Republic Bank Limited, for the past 16 years, is meant to share the message of the season while giving the choirs an avenue in which they could express themselves through music, song, drama and dance. Opening their set with “Mona Lisa” followed by “Raindrops” the choirs, directed by Bernadette Laughlin-Scott, belted out a number of traditional Christmas carols that kept the large and appreciative audience in a festive mood. From as early as 5:30pm, excited members of the public turned out on the greens, equipped with their mats and chairs, to witness the pre-show which featured The Love Movement Kaizen Love Tones. In her address, Kimberly Erriah- Ali, Group General Counsel, Corporate Secretary, Republic Bank, complimented the Love Movement Choir for their “Gift of Love”, while encouraging the audience to hold true to the spirit and the meaning of the season. “It is a time of giving just as much as it is for receiving. As we give and receive today with our families and each other, I encourage us all to remain open vessels for that Christmas spirit as it fills and renews us,” Erriah-Ali said. The free concert, which featured the Love Movement Senior Choir, the Republic Bank Love Movement Youth Outreach and the Lights of Love Children’s Choir, entertained the audience with some traditional songs and carols. With selections like; “Rocking Royal Christmas”, “I’ll be home for Christmas”, “Joy to the World” and “Most Wonderful Time of the Year”, the Love Movement Choirs, gave all in attendance a concert to remember. 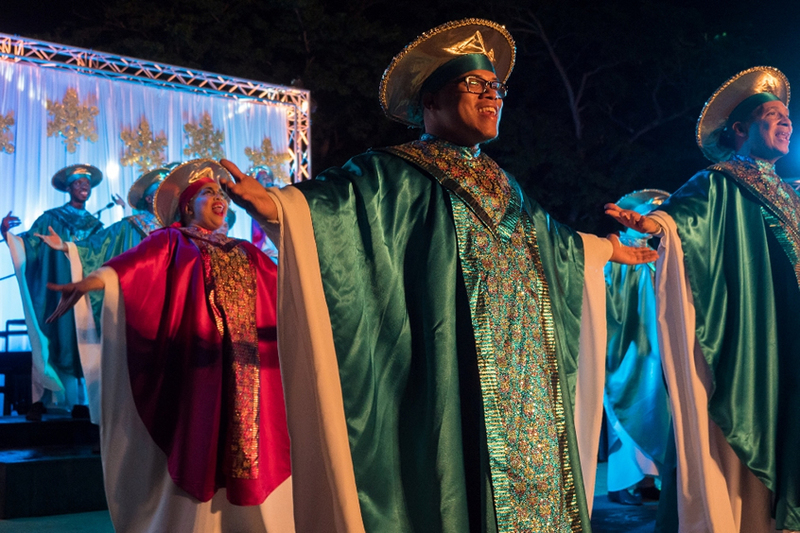 Across in the sister isle, the Bank also hosted its, “Carols at the Botanical Gardens” with performances from the St. Hilaire Brothers, soca-parang performer, Bindley Benjamin and Kleon McPherson, who treated the audience to a spoken word piece. Despite the weather conditions, the event was well received by the audience, who packed the Gazebo at the Botanical Gardens, Claude Noel Highway. David Dillion, Manager’s Assistant I, Credit, brought greetings on behalf of the Bank, saying, “Christmas might mean many different things to many of us, and while this year has given us challenges and surprises at every turn, we are all here, now, assembled as a community focused on celebrating what is without a doubt, the most wonderful time of the year. Republic Bank views its commitment as an important investment in the future of the young people in Trinidad and Tobago. Republic Bank is pleased to have shared with the nation the powerful message of love and hope through the hosting of these concerts, and takes this time to wish the nation a happy, holy and peaceful Christmas. It’s the Most Wonderful Time of the Year: With hands raised, members of the Love Movement Senior Choir, delivers a pore-raising performance during the Republic Bank and Love Movement “Gift of Love” Christmas concert, held last Saturday at Adam Smith Square, Woodbrook. 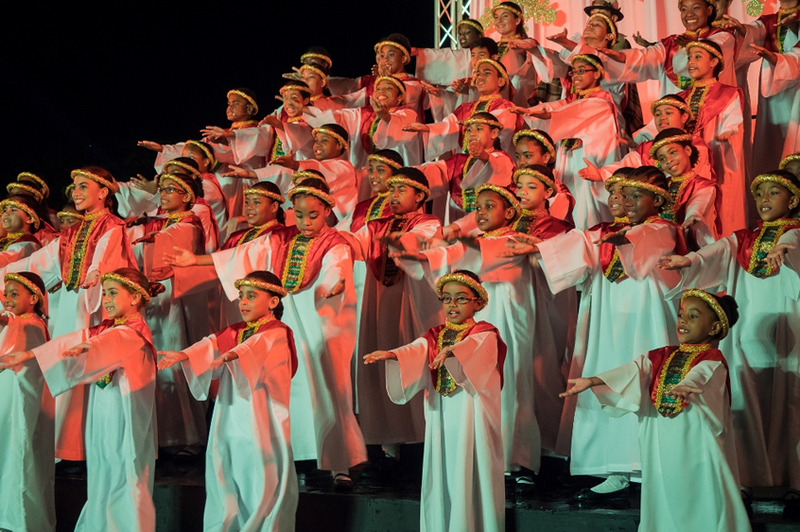 From the mouths of babes: Members of the Lights of Love Children Choir, had the audience eating out of their hands, at the Republic Bank and Love Movement “Gift of Love” Christmas concert, held last Saturday at Adam Smith Square, Woodbrook.